What would you do if you knew you had only seven days left to live? Such was the case with Robert Hardy, who had always lived according to the maxim, “self-interest first.” Influential and wealthy, Robert had embraced anything that gratified his tastes and fed his pride. But now everything has changed as he seeks to undo the sting of his bitter past! 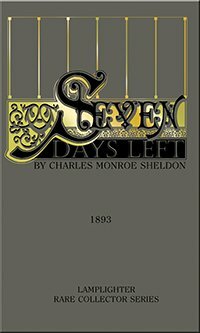 Seven Days Left is an ideal launching ground for thought and discussion on many critical topics today: social justice, discrimination, human rights, temperance, family relationships and environmental issues. A compelling read! From Hannah Bartin of Columbia, Missouri on 1/28/2016 . While this book wasn't what I expected it was still a good book ! From Michelle Deuling of Grant, Michigan on 1/27/2016 . An excellent thought provoking book! It is well written and an easy read! A book that may just change the way you live your life!